Microsoft has really outdone itself with the new Xbox One X. You can now play games or play videos in 4K resolution on the new Xbox. While the console may have improved, there are issues which gamers have to suffer when they’re using the new Xbox One or the Xbox 360. Higher latencies are still an issue, and DDoS attacks remain a problem for the high-end online gamers. Gamers may also find some games unavailable in their region on the Xbox marketplace. Such content is majorly unavailable in most countries for one reason or another. Similarly, those who use Xbox to stream content online suffer from similar issues as much of the content is unavailable in their region. Netflix, Hulu, the Amazon Prime, and others are either completely inaccessible, or they have content which is unavailable in most regions around the world. In these and many other cases, a VPN can be of great help. Not only does it secure you from DDoS attacks and other such malware, but you can use it to stream your favorite content online, or unlock games which may be unavailable in your region. Contrary to popular belief, a VPN does much more than grant complete internet freedom. Taking our service into account, you will come to realize it is just as valuable to gamers looking for a smooth online gaming experience. Additionally, we also offer numerous features to ensure your personal and confidential information is protected at all times, regardless of the server you are connected to. Seeing how users have numerous servers to choose from, lag will not be a problem. How you ask? It is really simple, as you will be able to choose a well optimized server, specific to you region, thus allowing you to game online with ease. You can setup VPN on Xbox 360 & Xbox One via your Wi-Fi router, laptop, and desktop. Following step-by-step instructions will help you to setup VPN. 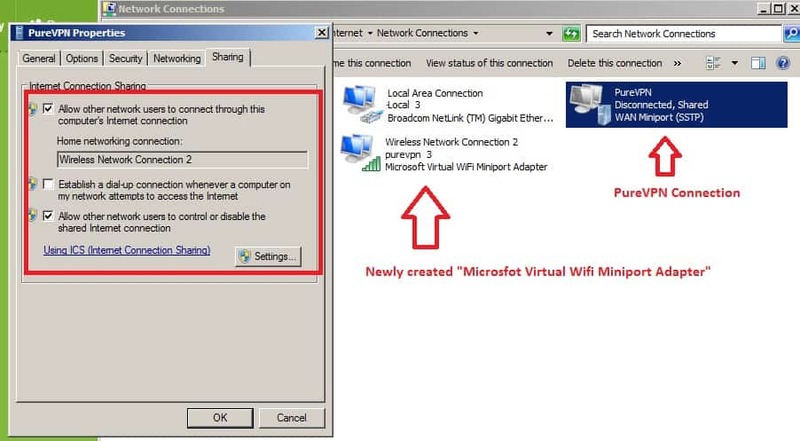 Once your router is set up to run a VPN connection, all you require is to turn on your Xbox 360 & Xbox One Wi-Fi to connect to the router. First make sure you have PureVPN software installed and working on your Windows device. 1. Connect your Xbox 360 & Xbox One to your computer using a crossover cable. 2. Click the ‘Windows Menu Button’ at the bottom left hand of the screen. 3. From the menu list, click on Control Panel. 4. Once Control Panel window opens, click on ‘Network and Sharing Center’. 5. Click on ‘Change Adaptor Settings’ on the left hand side of the screen. 6. Right click on the icon titled ‘PureVPN’ and then select the option titled ‘Properties’. 7. Once the properties window is displayed open the tab titled ‘Sharing’. 8. Now, place a check mark on the option titled ‘Allow other network users to connect through this computer’s internet connection’. 9. Click the option titled ‘Home Networking Connection’. It will reveal a dropdown menu with your available internet connections, and possibly a connection titled ‘Xbox’. Select Xbox (if it is available) and if it is not available, then click the connection you want to share with your console. 11. Now, connect your computer’s PureVPN Windows App to PureVPN’s desired server. 12. On your Xbox 360 & Xbox One controller, press the ‘LIVE’ button to go into the menu. 13. Now, go to ‘Settings’ tab and then select ‘System Settings’. 14. Under the ‘System Settings’ tab, select ‘Network Settings’. 15. Under the ‘Network Settings’ tab, select ‘Wired Network’. 16. Now, accept all settings and continue for a ‘Test Connection’. 17. Once everything is connected, simply sign in to your Xbox 360 & Xbox One account. And you’re done! First make sure you have PureVPN’s Mac software installed and working on your Mac device. Place a checkmark on the box titled ‘Internet Sharing’ to enable internet sharing. When the sharing is active, the ‘Internet Sharing’ icon will turn green and the status will change to ‘On’. Now, connect PureVPN Mac app to PureVPN’s server. Pure VPN is one of the most trusted VPN providers. Having state-of-the-art VPN technology and excellent infrastructure, gamers from around the world use PureVPN on Xbox and other consoles. How To Install Kodi on Xbox One? Kodi is a great open source media player that has an infinite supply of content on it. Just like there are apps on smartphones, there are addons on Kodi. Being an Open Source platform, anyone can create an addon for anything on Kodi and make it available online. This explains why the content supply is infinite. You can install Kodi on Xbox One in just a few minutes. Just follow the steps mentioned below and get access to unlimited video entertainment on you Xbox. Installation will begin. Wait for the installation to complete. Start using Kodi on your Xbox. If you are already a Kodi user, you would know already how to install addons from official and unofficial repositories. If you don’t, here is a guide to understand everything about Kodi. Since routers block some ports by default, you will have to set up a port forward to play your favorite games without issue. It’s also useful for gaming because it not only stabilizes your connection, but also sometimes even makes it faster. To make the process of setting up port forwarding easier for gamers, PureVPN offers the Port Forwarding Add-On. This means that you can securely and conveniently connect your Xbox console with any server of your choice. Now that you know how to set up a VPN on your Xbox console, you should wait no longer than you already have. However, if you have any problems, or wish to offer suggestions, you can do so by commenting below, or you can talk to one of our live support agents instead. I have a question… if everything is setup correctly and Xbox is connected to VPN .. if I check IP settings on my console there should be IP from country which I’ve chosen via VPN or from my country?